Mushroom Model Publications (MMP) is located in the U.K. All their books are printed in Sandomierz, Poland by their assciate Stratus in the English language. Stratus also does their own line of books in both Polish and English. This book is hard cover of 38 pages in 8 1/4" x 11 3/4" page format. The book shows detailed drawings of the famous Polish (used in 1939) aircraft instrument panels in great detail. The panels shown in the book are for the aircraft listed above. The cover of the book shows a large color illustration of the PZL P.11C instrument panel. This is repeated smaller in the book in the chapter on that plane. There is a black and white photo of the inside of the cockpit of the PZL P.11C and a photo of the aircraft sitting on a runway. The large color illustration of its dashboard appears again with a large illustration of dashboard frame with no instruments shown. Finally, there is color illustrations of all the instruments as large illustrations. There are 11 of these. The chapter on the PZL P11C ends with 3 black and white photos of the inside of the aircraft. The next chapter is on the PZL 37 Los. This is twin-engined Polish bomber. The chapter starts with a black and white photo of the instrument panel and a photo of the aircraft sitting on a runway. Next is a large color illustration of the dashboard both with and without the instruments in place. Large color illustrations of all the instruments is provided. There are 12 of these. The chapter ends with 3 black and white walkaround type photos of the nose and inside of the plane. The chapter on the PZL 23 Karas begins with a black and white photo of the instrument panel and a shot of the aircraft sitting on a runway. Then the usual large color illustrations of the instrument panel shown with and without the instruments installed. There are 12 large color illustrations of all the instruments. This chapter ends with 3 black and white photos of the inside of the cockpit. The Lublin R-XIII chapter begins with a black and white photo of the instrument panel and 2 photos of the aircraft sitting on a runway. This is followed by a large color illustration of the dashboard of the Lublin R-XIII G with and without the instruments in place and a black and white photo of the inside of the fuselage structure where the cockpit is. There are 11 large color illustrations of the instruments provided. The chapter ends with 3 black and white walk around photos of the framework of the aircraft. The chapter on the RWD-14 Czapla begins with a black and white photo of the instrument panel and a shot of the aircraft sitting on a runway. Next is the usual large color illustrations of the instrument panel with and without the instruments installed, over large color illustrations of 4 of the instruments. The next page shows 6 more large color illustrations of the instruments. The chapter on the PWS-26 begins with a black and white photo of the instrument panel and a shot of the aircraft on a runway. Next is the usual large color illustration of the rear cockpit instrument panel with the instruments installed and uninstalled. This is followed by a large color illustration of the instrument panel in the front cockpit, next to a black and white photo of the instrument panel and a large color illustration of one of the instruments. The next page has large color illustrations of the instruments in the front cockpit. The chapter ends with 3 black and white photos of the aircraft in a museum somewhere, along with a color photo of the left altimeter in the aircraft. The captions call out the names of all the instruments. 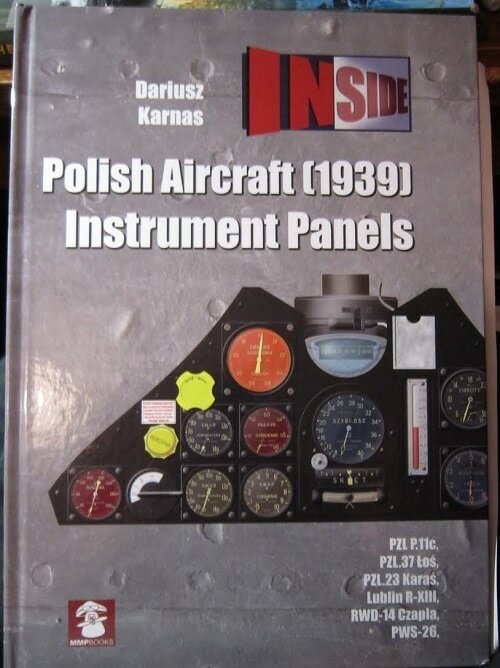 This is a pretty thorough book about Polish aircraft instruments and there are a few kits of the aircraft on the market. I want to thank Roger Wallsgrove, Editor-in-Chief of MMP and the folks at Casemate who sent me this sample. Casemate is the U.S. distributor for MMP books.